Pork belly is easy to cook and can be used in a large variety of ways. Here I’ve marinated the pork belly, roasted it and then pulled it and made tacos but it other times I’ve served it roasted and about 45 minutes before its ready, I add small potatoes to the roasting pan. I serve the pork in slices and spoon the cooking juices over the meat and potatoes. The slices of onion that the meat has been sitting are also delicious to eat with the meal. 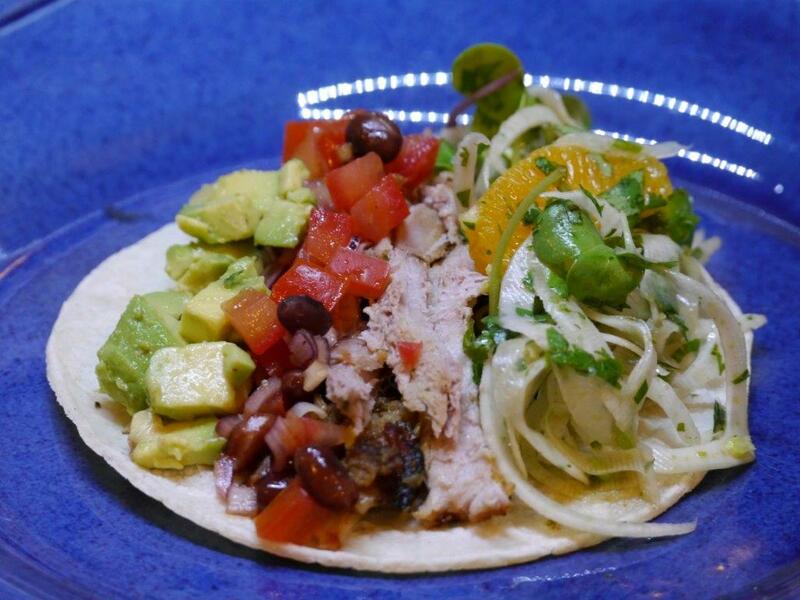 In this recipe I’ve pulled the cooked pork and put together a variety of toppings for the tacos. Combine the garlic, paprika, fennel seeds, salt, zest and juice of the oranges, coriander and pepper. Rub this over the flesh side of the pork belly, place it flesh side down sitting on all the marinade, cover and marinate for as long as you can, preferably overnight. Take the meat out of the fridge and bring to room temperature. Make sure the pork belly skin is dry. Preheat your oven or lidded BBQ to 220°C. Put the onion slices in an oven dish and place the pork on top making sure you include all the marinade. Pour in enough cider to come part way up the sides of the pork belly. Don’t pour any on the skin otherwise you won’t get the yummy crackling. Place in the hot oven for 20-30 minutes until the skin starts to go crisp. Turn the oven down to 170°C and cook for about 90 minutes or so. Top up with cider from time to time if necessary. Take out of the oven and let the meat sit for a few minutes. 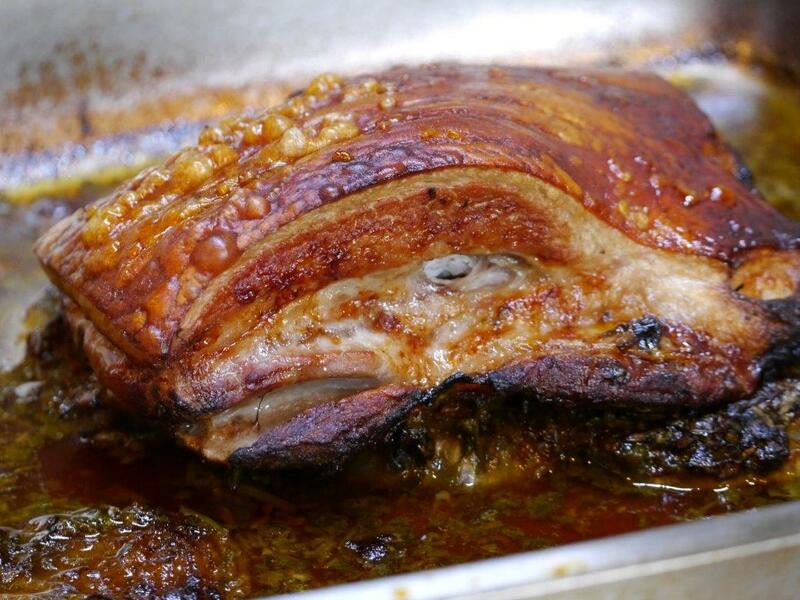 To serve, remove the crackling and then pull the meat apart and put it on a plate. Drizzle over some of the pan juices. While the meat is cooking make a variety of taco fillings – decide if you want any of these to be spicy or just have a chilli sauce for everyone to help themselves. Fennel and orange salad with coriander and microgreens – I sliced two fennel bulbs using a mandolin, added segments from two oranges, a bunch of finely chopped coriander, microgreens, juice of one orange, olive oil, pomegranate dressing and a few dashes of tabasco. Tomato and red bean salsa – 2-3 tomatoes, de-seeded and chopped into small cubes, finely chopped red onion and ½ tin drained and washed red beans, a good dollop of medium hot Mexican sauce. Avocado – two avocados, peeled and cut into small cubes and mixed with lime juice and salt and pepper.